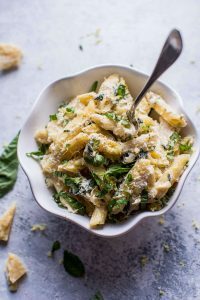 This creamy lemon basil pasta is a rich yet fresh vegetarian pasta dish that is ready in only 20 minutes! 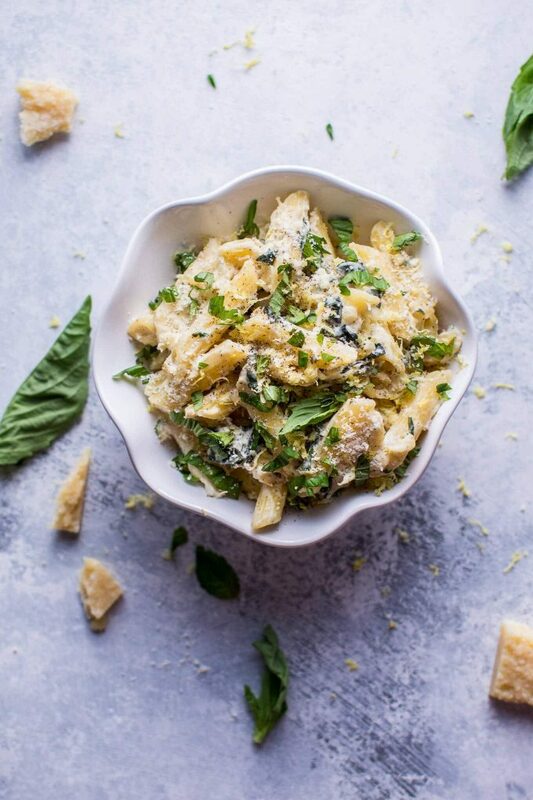 This pasta dish is creamy, yet it’s cream-free. Usually I don’t shy away from cream around here, but I wanted to try something a bit different. I used cream cheese in place of cream, and its tanginess perfectly pairs with the lemon in this dish. Fresh basil is one of my favorite things. It really lifts anything you put it in! I sometimes struggle to find nice basil in the winter, but that doesn’t stop me from hunting it down and buying it every week anyway. I sometimes wonder if I could grow my own (I have reasons not to, including my total lack of green thumb). Maaaybe we’ll attempt it this summer. Will you make this creamy lemon basil pasta? 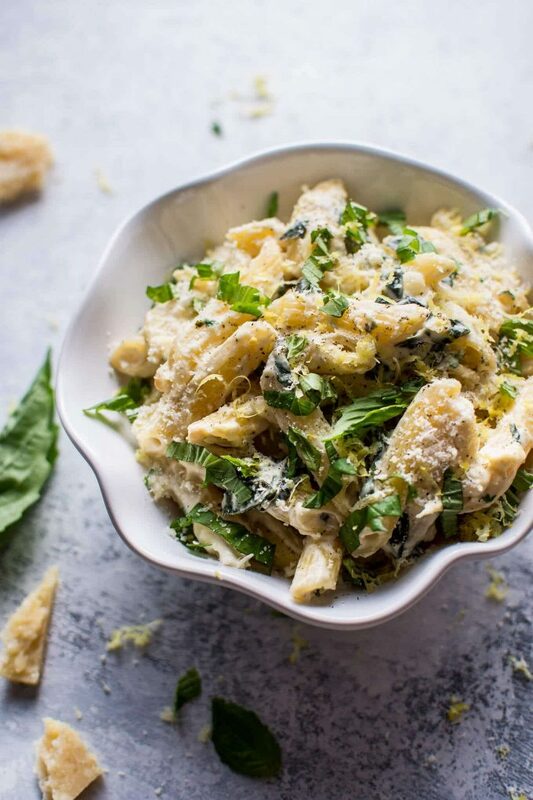 A deliciously creamy vegetarian pasta dish that's super quick and easy. When the pasta water is about to boil, add olive oil to a skillet on medium heat. Add the onion and sauté for 8-10 minutes, or until it's softened and lightly browned. Add the cream cheese, lemon juice and zest, and Italian seasoning. Stir for a couple of minutes until the cheese has melted into a sauce. Stir in the parmesan. Reserve 1/2 cup of the pasta water prior to draining the pasta. Add 1/4 cup of the pasta water to the sauce. If you want the sauce thinned even more, add pasta water one tablespoon at a time. Once the sauce is thinned to your liking, add in the basil, parsley, and salt & pepper. Add the pasta to the skillet and toss. Serve immediately. Thanks! Yeah, I default to cream, but the cream cheese is something different. I’d definitely try it again. Thanks for the basil growing tips! My husband definitely has more of a green thumb than I do. The only issue will be having someone water it when we’re away. I’ve been on the lookout for quick and easy recipes without meat lately, just for a change, and this one looks great! I’ll have to give it a go. Great! I hope you like it! ???? Thank you for sharing, this sounds like a wonderful dish. I can see my husband grilling fresh Italian sausage to eat with it because to him the meat is the meal. ???? That actually sounds like a great addition to me. ???????? Fab recipe, may I suggest you use the white pepper mill with this one? Not only does the heat of the white peppercorns underpin the cream cheese rather better than the more aromatic black pepper, it keeps the dish a lovely pale colour. Using the black peppermill gives a speckled sauce that just slightly irritates me. Yeah, I know, picky, picky, picky . . . . .
Love that suggestion, Gavin! I’m picky too haha. So glad you liked the recipe. Hi. This looks wonderful. Noticed you said you wish you could grow your own. Check out AeroGarden.com. I use this with the international basil pods and it is so easy and no green thumb required. Comes up 5 times faster than soil. And you will have plenty. Indoor, no bugs, tastes out of this world. Check it out.